The second leg between the bitter rivals takes place tomorrow evening. BOCA JUNIORS HAVE had their bid to be awarded the Copa Libertadores title rejected by the Court of Arbitration for Sport (CAS). The Copa Libertadores final second leg – which was postponed after Boca’s bus was attacked on the way to the original fixture on November 24 – will finally take place at Real Madrid’s Santiago Bernabeu stadium on Sunday. However, Boca confirmed on Friday that, having had an initial appeal rejected by CONMEBOL, they would take their case to CAS, claiming that they should be awarded the trophy without playing in the rearranged Superclasico against their arch rivals. But, in a statement issued on Saturday, CAS confirmed that it has denied Boca’s appeal, and the second leg will take place as planned. “CAS has dismissed the urgent request for provisional measures presented by Boca Juniors, who requested the suspension of the second leg of the final of the Copa Libertadores 2018,” the statement read. The first leg between the two, which was postponed due to a waterlogged pitch before taking place on November 11, finished 2-2. 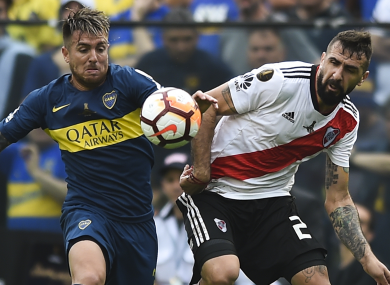 Boca president Daniel Angelici had revealed in November that his side were opposed to having to play the second leg following the actions of their rivals. He said: ”We have decided to submit a request for disqualification to River. “Today we expand the petition with 46 more pages, with videos, photos and evidence. Now the Disciplinary Tribunal has to answer. “I hope that the court gives its answer with reasons. We are not willing to play any matches until the court decides. We believe that there are reasons to attend our request. “If the court decision is negative, we will see if the reasons are strong. If they are not, we will appeal to the Chamber of Appeals of CONMEBOL. “The rescheduling of the game is a decision of the CONMEBOL Executive Committee, not the Disciplinary Tribunal. We want them to adhere to the law, we believe that within CONMEBOL there are precedents for the request of Boca to be received positively. Email “Appeal rejected: Copa Libertadores final between Boca and River will go ahead in Madrid”. Feedback on “Appeal rejected: Copa Libertadores final between Boca and River will go ahead in Madrid”.